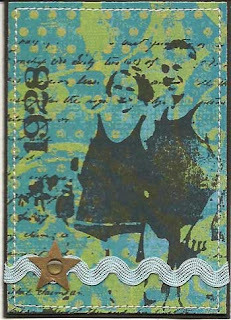 This is a new ATC I recently made, "Fun In the Sun". 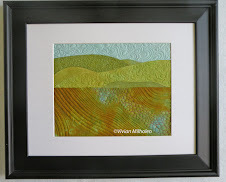 I decided to combine stitching and paper on this one. I love this stamp by Time To Stamp. I added some ric rac and punched out a gold star. The bubble on the star is one of the clear rain drop stickers. I hope everyone has a fun, safe Memorial Day weekend! Today is our daughter's birthday! Happy B-Day, Traci! 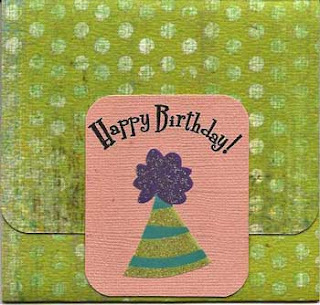 I made her this card but couldn't post it until she received it in California. While she was here visiting recently, we gave her her birthday present. The picture of her is either her first or second birthday. I will have to find the original to be sure. (This is one I had on the computer). She's still our little sweetheart. 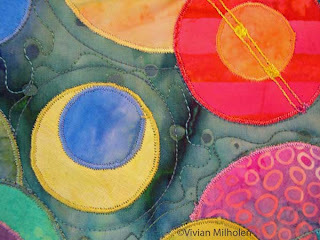 While looking at on-line pictures of a current quilt exhibit, I saw a quilt that reminded me of my quilt, "Almost Connected" (Sold), that I made in February, 2005. So, I perused my Adobe Photoshop Elements and found the picture I had taken. 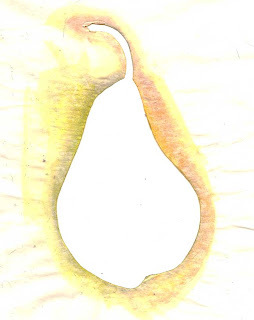 I was really into circles at that time. 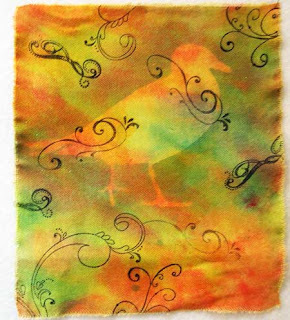 I think I may make another one because I liked it so much. I made it for the "Keiko and Friends" exhibit by Laura Wasilowski. 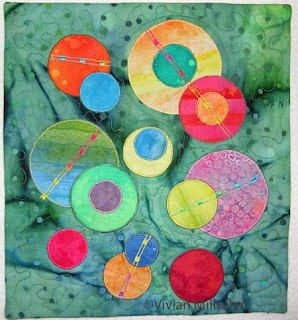 It's posted on this website with the other art quilts if you want to take a look. 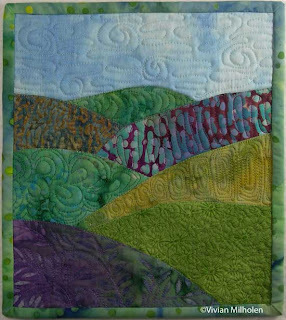 There are some wonderful quilts there to inspire you. Sometimes, it's nice to be reminded of the good things you made in the past. I just finished cleaning out my studio closet. Someone could write a book on studio closets. Mine is actually a bathroom to be...meaning all the waterworks pipes and vents are there. But if I turn it into a bathroom, where would I put those necessary things like board books (I may alter them one day), latch hook rug canvas (it makes a cool stencil), empty heart-shaped valentine candy boxes (I saw something somewhere on the web for turning them into something), boxes of Easter egg dye (it dyes tags and other things), and other necessary items? I did use my label maker and labeled the clear stacking drawers and containers. One nice thing I did let go of was all my old quilt magazines (some from the 90's!). I just tossed them all in the recycle bin. 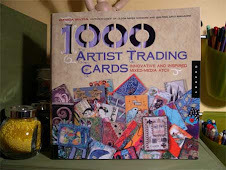 I won't let go of my Quilting Arts or Cloth, Paper, Scissors. There is always an article or two that I re-visit in those publications. Maybe I have Spring fever. This one is done on canvas, also. 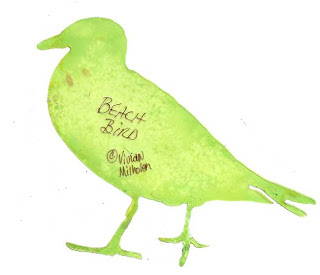 It is a mask of my beach bird taken from one of my photos. 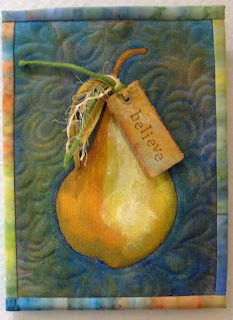 The background is painted with Golden Fluid acrylics and I added some swirl stamps. Then I place the mask over it and sprayed it with the Tsukineko Willow Walnut Ink. (Thus the green bird mask below, which actually gives me more ideas as I love green birds). I don't know what I will make from this piece, maybe a journal cover.